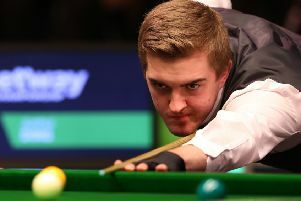 SCOTT Donaldson may only just have won his first match of the season but don’t expect world No.1 Mark Selby to hold any fear for the Edinburgh snooker star. Donaldson’s reward for ending a run of ten consecutive defeats by beating John Astley 6-2 in the first round of the Betway UK Championship on Wednesday is a second-round clash with the all-conquering Selby on a TV table at the York Barbican on this afternoon. The 33-year-old is the reigning UK champion, a three-time world champion and holds a lead of more than £770,000 atop the world rankings. Yet Donaldson was unfortunate to lose 4-3 to the Leicester cueman when they squared off at the English Open in October and actually beat him 4-2 in their previous meeting in 2015. “I’m not afraid of any player on the tour,” said Donaldson. “I know I’m good enough to compete with anyone and you have a chance against every player when you’re in the balls and they’re sitting down. The only difference is the top players are more clinical. But Mark could struggle and I might not even have to play that well to beat him, you never know. “It probably would have bothered me a few years ago being on a TV table at a big tournament but not anymore. Four of Donaldson’s ten losses this term had come in deciders and his run to the semi-finals of the Welsh Open back in February proves he is much better than his dismal record this season suggests. He racked up breaks of 93, 117 and 129 in beating Astley – a man one place above him in the world rankings – in round one and admits it was nice to get the monkey off his back.